The leaks rust caused on underground tanks of old gas stations in Michigan left the state struggling to get the clean up done. To save others from such severe rust effects, MyRustRemoval.com advised the use of a green rust spray. 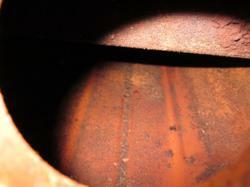 Besides metals, rust and its stain can also damage plastic, concrete, rubber and even fabric. Rust on old tanks of abandoned gasoline stations rendered Michigan struggling. According to a report from BridgeMI.com, the state is having a hard time cleaning up the environmental mess the tanks left. On the other hand, knowing that rust can damage almost all items, MyRustRemoval.com advised property owners to always prepare a safe rust removal product. Reportedly, corrosion ate away the old tanks in Michigan's deserted gas stations causing them to leak. The leaking, in return, contaminated the state's water. With gasoline and other chemicals, the tanks poisoned it's groundwater, creek and soil. Worse, in some cases, the leaks also polluted the drinking water wells. However, despite the efforts for clean up, many of the environmental and health risks of the leaks remain unsolved. One reason pointed out is the lack of enough fund for the cleaning up program. The fact that the rate of completing cleanups in Michigan is at an average of $400 000 also contributes to the derail of the program. I've dealt with rust several times before. And all those times taught me one very important thing about rust. That is it's destructive and it spreads fast. The longer you wait to get it treated the bigger is its damage. And with its eating away of Michigan's old gasoline tanks, a huge damage it is surely causing the state. Leaking underground gasoline tanks have long been giving Michigan very serious environmental problems and posing health problems. They are contaminating the state's groundwater, creek and even the soil with gasoline and other chemicals. In some cases, they even pollute the residents' drinking water wells. Rust is deemed the culprit of all those environmental problems. However, the continued existence of the said environmental concerns is being attributed to the derail of the clean-up programs. And with the shortage in funding and the fact that the average cost of clean-up in Michigan is $400 000, it seems that the state is up for more years of old, rusty and leaking fuel tanks' negative effects. Pollution will fester at many of those sites for years, if not decades, because Michigan’s LUST cleanup program has gone off the rails: Completed cleanups are down 80 percent from the late 1990s; the average cost of a cleanup here is $400,000, four times the national average; and Michigan has one of the nation’s worst rates for completing cleanups, according to government data. Rust can damage almost all items according to MyRustRemoval.com. Besides metals, rust and its stain can also damage plastic, concrete, rubber and even fabric. To prevent the worse of its effects to any item or surface, the site advised any rust sufferer to act quick after the corrosion is discovered. However, the site added that before anyone can implement a treatment, a rust removal product must be picked first. Of all the rust solutions available though, it emphasized that property owners must pick the rust remover that is safe apart from effective. That's to prevent health risks, it also stated. Get a safe rust remover today. Go to http://www.MyRustRemoval.com for a sample of a safe rust spray.